Mirhosseini, M.; Pou, J.; Karanayil, B.; Agelidis, V.
This paper discusses the control of the positive- and negative-sequence components of a large-scale grid-connected photovoltaic system (GCPS) under unbalanced voltage sag conditions in the grid. Some issues regarding stability and dynamic performance of the system occur when applying PI controllers in the current control loops. The reason is the delay that the filtering method imposes when extracting the current/voltage sequences. Because of such a delay, the dynamic response of the system becomes slower compared with the case when no filtering technique is needed. Furthermore, there is a strong restriction on choosing suitable parameters for the current/voltage loop controllers without compromising system stability. All these issues are discussed in this paper on a 1-MVA GCPV system using MATLAB/Simulink software. Mirhosseini, M. [et al.]. 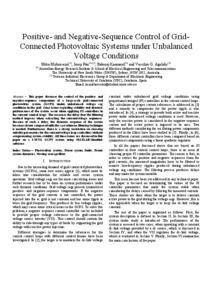 Positive- and negative-sequence control of grid-connected photovoltaic systems under unbalanced voltage conditions. A: AUPEC - Australasian Universities Power Engineering Conference. "Proc. Australasina Universities Power Engineering Conference AUPEC 2013, 29 sep - 3 Oct., Tasmania, Australia". Tasmania: 2013, p. 1-6.